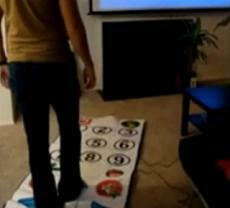 A dance mat for a TV remote? It sounds like a fat kid’s nightmare. But what a great way to get them off the sofa while they surf their favourite channels. TV remotes are without a doubt a lazy mans tool – it does all the work while you bask in your favourite position on the sofa. If it wasn’t for the occasional hunger pangs and calls of nature, you’d never have to move. The Dance Mat remote control throws all that lethargy out of the window all in favour of dance. It’s clear from the image provided, almost an instantaneous realisation in fact, what’s going to have to go down in order to get to Sky One for your next Lost instalment. But just to clear up any ambiguity for those who aren’t familiar with the dance mat concept – you’ll need to jump on the necessary buttons to execute your commands. This may or may not involve a certain level of sweat (it depends how rigorous your channel surfing is) . It’s not available for purchase though, and if you want your own version you will need to do what this intrepid inventor did. You’ll need an oversized novelty remote, two PS2 Dance Dance Revolution mats, a PS2-to-PC controller converter box and the ability to create your own source code. And voila. Who&apos;s gone from Blackberry Bold to BB Storm?